We give our first impressions of the new Panasonic Lumix GX1 with sample photos, videos, and menu walkthrough. The Panasonic Lumix GX1 is designed to fill the gap left by the GF1, as the GF2, and GF3 were announced, more serious photographers were missing the more advanced controls found on the GF1, the GX1 is designed to be Panasonic's answer to this seeming lack. With a larger hand grip, and higher resolution 16 megapixel sensor from the Panasonic Lumix G3, it should meet the needs of advanced photographers. Read our full Panasonic Lumix GX1 review. 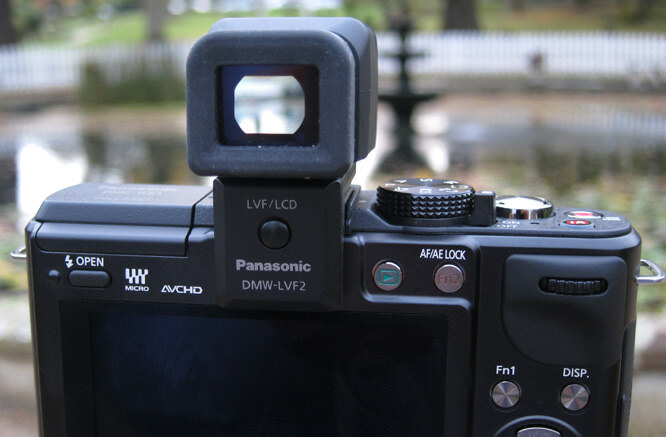 Panasonic has also announced a new LVF2 Viewfinder with 1.44million pixels, the view through this looks good, and is quite large with a diopter adjustment dial underneath. The viewfinder can be tilted. Handling - A large front rubberised hand grip is at the front with a thumb grip on the back. A focus assist lamp is on the right, and the pop up flash can be tilted upwards for bounce flash. Menus - Not much has changed here, but the menus are now black to match the colour design of the X lens range. Each section is still colour coded, and the menu items are spread over several pages, as you can see in the walkthrough video below. Battery life - The camera's battery life is rated at between 300 to 340 shots depending on lens used with the camera, with the 14mm Panasonic lens giving the best performance. We used a number of lenses, and took over 190 shots with the battery showing around 50% life left. Speed - While we didn't put the camera through our usual in house speed tests, we used the camera with a number of lenses and found focusing was very rapid, with the camera's shutter response also very rapid. The continuous shooting at full resolution was around 4fps as expected, and shooting at the 20fps mode reduces the image size to 4 megapixels, as well as switching the camera to an electronic shutter. If you do use long exposures such as a 10 second exposure, the camera will spend another 10 seconds shooting a dark frame to reduce noise from the image, delaying the next shot. While these are all pre-production photos, you can still click "Hi-Res" to view the full size sample photos, and there will be more added in the equipment database when we get our hands on a full production version of the camera. Sample photos - There is a slight magenta cast on photos of people, particularly when not using flash, but as this is a pre-production model, we can excuse them for this, as the final version should hopefully have resolved this. ISO shots - here you can see the full ISO range of the camera, from ISO160 to ISO12800, although please note this is a pre-production model. Digital Filters - effects and colour options - the GX1 adds two new digital filters: Lo-Key and Toy Camera bringing the total number of filters up to 9, with a number of colour options also available. Video: Full HD Sample Video, an example using the power zoom lens to zoom in and out can be viewed on our youtube channel. The Panasonic Lumix GX1 with the standard kit lens or body only offers quite good value for money as a premium metal bodied camera, and would certainly make quite a tempting upgrade options for owners of older Micro Four Thirds cameras. LUMIX GX1 – Body only will be available from mid December, Panasonic eShop £499.99, LUMIX GX1K – with the H-FS014042 lens, (Standard Kit lens) will be available from mid December, Panasonic eShop £599.99, LUMIX GX1X – with the H-PS14042 lens (compact 14-42mm X lens) will be available from mid January, Panasonic eShop £729.99. The Panasonic Lumix GX1 is designed to satisfy the needs of advanced photographers, and those wanting a premium compact camera with higher resolution sensor and high quality video. The camera looks great with the new compact 14-42mm X lens that compacts to the size of a pancake lens when off. While image quality is not yet final, initial impressions and our time using the camera was enjoyable with the camera providing a responsive experience, making shooting easy. The handling of the camera was very good and we can see this being a popular camera. Read our full Panasonic Lumix GX1 review. 'mobile'.....though the tilting EVF goes someway to achieving that . I'm not too bothered about the new GX1 at the moment, being pretty new to a GF2 and enjoying the experience, but it will be interesting to see how 16Mp handles high ISO. Of more interest is that new EVF and whether it's backward compatible! I wish they'd mentioned the price of the EVF - those things are usually horrendously expensive for what they are. Do you ever get the EVF included in a kit? The EVF is £200. They may offer it as a kit. What advantage, if any, would the GH2 have over this, joshwa. I think the biggest advantage would be the G3 sensor - compared to the GH2 - noise would be lower. Also size, but the GH2 has higher continuous shooting speed, viewfinder, handling, etc. [quote]I think the biggest advantage would be the G3 sensor - compared to the GH2 - noise would be lower. Also size, but the GH2 has higher continuous shooting speed, viewfinder, handling, etc. [/quote] I really like these Panasonics. At the moment I have an Olympus E-PL3 and a Pentax K5 with a full set of lenses. I'd like to go over to 2 CSCs so that I only needed one set of lenses and then I'd have the E-PL3 for a carry around (I like the swivel screen and body anti-shake for my Panasonic 20mm f1.7) and the GH2 or G3 with 12mm f2 and a selection of micro 4/3 lenses. Are you saying that the G3 is better quality than the GH2? Things are changing so fast lately! Quote:I think the biggest advantage would be the G3 sensor - compared to the GH2 - noise would be lower. Also size, but the GH2 has higher continuous shooting speed, viewfinder, handling, etc. I really like these Panasonics. At the moment I have an Olympus E-PL3 and a Pentax K5 with a full set of lenses. I'd like to go over to 2 CSCs so that I only needed one set of lenses and then I'd have the E-PL3 for a carry around (I like the swivel screen and body anti-shake for my Panasonic 20mm f1.7) and the GH2 or G3 with 12mm f2 and a selection of micro 4/3 lenses. Are you saying that the G3 is better quality than the GH2? Things are changing so fast lately! 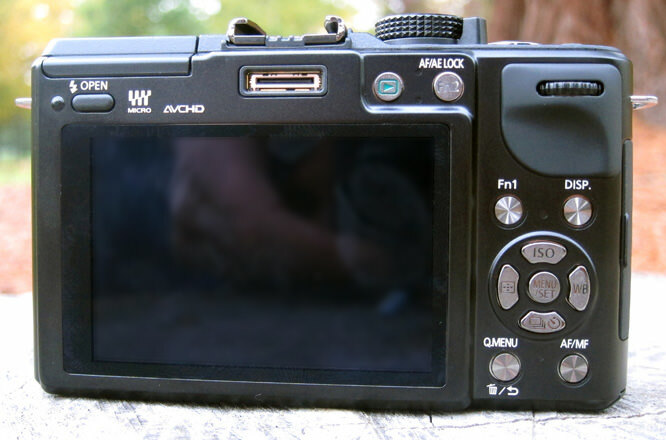 The stock pictures of the GX1 are better, and show more artistic merit, than the "sample images"--which are pictures that could have been taken by a machine. If showing off the qualities of a new camera is the focus of this article, shooting images one would be proud to have taken should be the desired effect. The camera looks great. The samples, not so great. The stock pictures of the GX1 are better, and show more artistic merit, than the "sample images"--which are pictures that could have been taken by a machine. If showing off the qualities of a new camera is the focus of this article, shooting images one would be proud to have taken should be the desired effect. The camera looks great. The samples, not so great. Although there's obviously noise reduction in the high-ISO JPEGs they still look pretty impressive [I'm not sure how great the test image is for this purpose though - the base ISO shots don't look especially sharp, but that might be the test card]. It's pretty, but hardly revolutionary, more Evolutionary in the way Canons have become. Arguably, this should have succeeded the GF1 (which I had but moved on to a G2) much sooner, cutting out the GF2 altogether. I feel enthusiast photographers were really hoping Pany would take GF1 development still further, this GX1 doesn't have a swivelling rear screen which is unforgiveable really unless you take the cynical view that it would stop them selling add-on viewfinders. A small improvement in IQ, and the X series lenses are interesting, but this isn't going to persuade me to 'move on up'. And please - please, ePhotozine, stop calling these cameras "mirrorless" - we don't refer to cars as horse-less or radios as wire-less, why call something by a feature that's missing? They are CSCs or ILCs if you like, but please, not "mirrorless" any more! At least I know what they mean by mirrorless. What do CSC and ILC stand for? Compact System Camera and Interchangeable Lens Camera. ILC as Interchangeable Lens Camera doesn't make much sense as it doesn't distinguish these cameras from standard DSLRs - perhaps Interchangeable Lens Compacts? Good point, Lemmy, I must try to learn a new acronym each day :P I think we should just call them all ILCs (Interchangeable lens cameras). Do we still need to distinguish between ones with a mirror and ones without? They may be compact, but they aren't toys. I think we should just call them all ILCs (Interchangeable lens cameras). Do we still need to distinguish between ones with a mirror and ones without? They may be compact, but they aren't toys.